In news that will be music to the ears of close-up photographers, Fujifilm has announced that it's bolstering its macro lens lineup with the addition of the XF80mm f/2.8 R LM OIS Macro. Until now, those wanting to shoot close-up images with an X Series camera have had to make do with the ageing 0.5x XF60mm f/2.4 R Macro – one of the first three lenses launched with the original Fujifilm X-Pro1. Fujifilm says the new lens will deliver beautiful bokeh, and also promises fast and silent autofocus thanks to the use of linear motors. It should also produce great results when you're shooting handheld thanks to the Optical Image Stabilizer system suppressing camera shake by up to five stops. The lens is weather- and dust-resistant. The XF80mm f/2.8 R LM OIS Macro will be available in November priced at £1,249 in the UK and AU$1,899 in Australia. US pricing is yet to be confirmed. 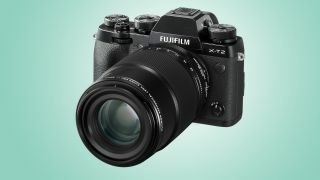 Fujifilm has also unveiled the latest development roadmap for its X Mount lenses, with plans to develop an ultra wide-angle XF8-16mm f/2.8 R LM WR zoom lens and an XF200mm f/2 R LM OIS WR prime telephoto lens. Both are scheduled for 2018, but otherwise no other information is forthcoming at the moment. Fujifilm is also growing its GF lens series for its GFX 50S medium format mirrorless camera with the announcement of the GF45mm f/2.8 R WR lens. The wide-angle optic sports a focal length equivalent to 36mm and maximum f/2.8 aperture, and weighs in at only 490g. The lens is equipped with a Nano GI coating, promising a clear depiction performance with reduced ghosting and flare. It's weather- and dust-resistant, and can be used in temperatures as low as -10°C. The XGF45mm f/2.8 R WR will be available in November, priced £1,699 in the UK; again US and Australia pricing are to be confirmed.